Can I add hyperlinks to my shopping flip pages? As an attractive catalogue, I think hyperlinks are required as an important element for marketing. Your catalogs will get much more success than ever before for the convenience the smart links provide. Any part of the shopping book pages allows you to add hyperlink modules. It will change color when your mouse moves on to the hyperlink to differentiate. 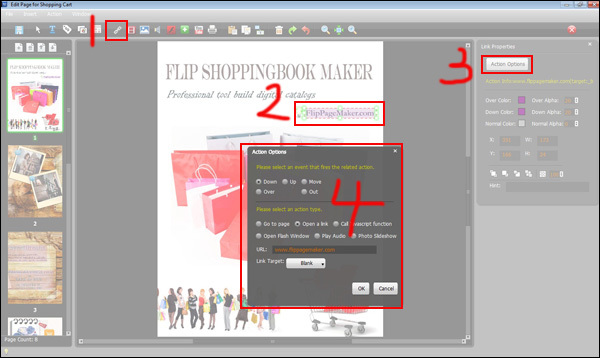 1 Start Flip ShoppingBook Maker, and then import a PDF. 2 Click on Edit Shopping Cart, and then click on Add Link. 3 Choose a place to add hyperlink, and edit the hyperlink in the ultimate right editing box.